Home » like » Samsung » Samsung GALAXY S4 » share » PC Expo 2013 "Like, Share & Win" Contest: Win Samsung GALAXY S4! 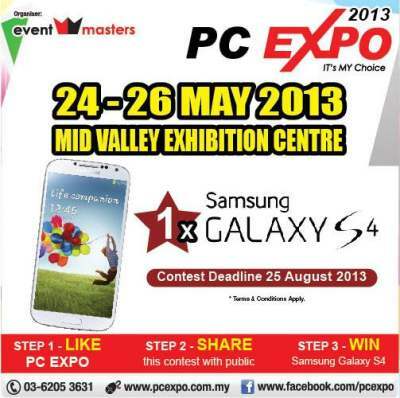 PC Expo 2013 "Like, Share & Win" Contest: Win Samsung GALAXY S4! LIKE PC Expo facebook page. SHARE this contest with public. Visit PC Expo 2013 "Like, Share & Win" for more details. Check out also PC Expo 2013 event details & promotions.